What Are The Best Dental Braces for Adults? Nowadays, people of all ages get braces to achieve straight and beautiful teeth. This has led to a revolution in the way people view teeth straightening. This is particularly true when it comes to mature patients. In the past, adults might avoid getting their teeth straightened out of fear of a lengthy orthodontic process or the stigma of big, metal braces. Today, however, adults are getting their teeth straightened in record numbers. Technological advances in adult braces have made them more convenient and less obvious. Adults do not have to live with the crooked teeth they were born with, just because they are ‘too old’ for braces. There is no such thing as ‘too old’, when it comes to straight teeth! Many of the patients who come to visit us at Cardiff Dental do have concerns, often based on common misconceptions from the internet. These worries about adult braces can lead to adults avoiding the treatment they actually need. If you are an adult who has malocclusion (crooked teeth), adult braces can straighten your teeth, improving both your appearance and your health. 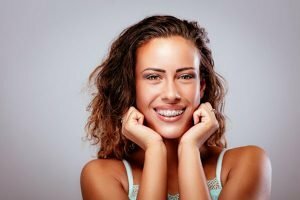 While cosmetic reasons for getting adult braces are obvious – we all want to look more attractive – they pale in comparison to the oral and health-related reasons for getting braces. Given these substantial health risks, adults with crooked teeth should view adult braces as a valuable investment in their long-term health and appearance. Adult braces can bring you straight teeth and drastically improved oral and physical health, even if there are temporary discomforts to wearing them. And luckily, modern dentistry has created a variety of different kinds of braces for different patients. Metal braces, made of high-grade stainless steel and attached to the front of teeth, are the most common. Pros: Usually, the least expensive option. Ideal for people with serious bite problems or very crooked teeth who want straight teeth as fast as possible. Clear ceramic braces are worn on the front of the teeth just like traditional steel braces. Unlike metal braces, they blend with the color of the teeth for a much less noticeable appearance. They may look better, but they may break more easily than metal braces. Pros: Much subtler than metal braces. Work more quickly than Invisalign option. Cons: Cost more and break more easily than metal braces. May stain easily without proper care. Lingual (or concealed) braces have brackets that attach to the back of teeth, so they are hidden from view. Pros: Invisible from the front. Cons: Cost; difficult to maintain; ineffective for serious cases; initial discomfort; adjustments are more difficult and time-intensive than with metal braces. “Invisible” braces are a series of clear, customized, removable appliances called aligners. Not only are these braces less visible, but they also are removable so they won’t trap food and plaque between your teeth like metal braces. Each aligner is worn for about two weeks and only removed for eating, brushing and flossing. This may be an option for individuals with mild spacing problems. Pros: Almost impossible to see; no wires or brackets; no food restrictions; easy to clean teeth. Cons: Not effective for severe cases; cost; don’t straighten as quickly as other options; can be easy to lose and expensive to replace. If you have cosmetic or practical issues that you think might require adult braces, please contact us here at Cardiff Dental, for an evaluation and recommendation that might change your oral health and appearance! 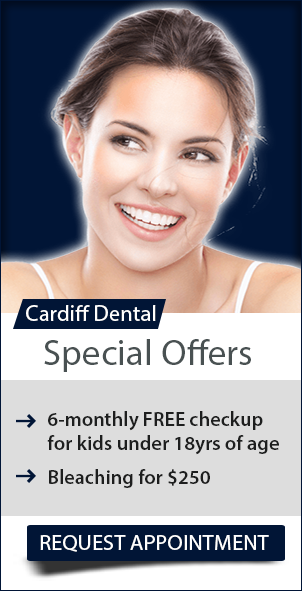 At Cardiff Dental, our goal is to make quality dental care affordable, including adult braces. We have a variety of promotional offers!